There are certain sporting moments that captivate their audience beyond any possible measure – not just for the scale of their achievement, but because of their romance. Jonny Wilkinson’s drop goal to win the 2003 Rugby World Cup; Liverpool’s miraculous comeback in the 2005 Champions League final; Usain Bolt’s world-shattering 100 metres at Beijing 2008. These moments burn themselves onto our internal hard drives never to be forgotten – moments that mean more than one team beating another or an athlete crossing the line first – they are the essence of what sport is about and why we love it so much. On 23 September, before the madness of the Ryder Cup pulled into full view, we had another such occasion when Tiger Woods, reborn from the ashes of his career, returned to the winner’s circle against all the odds. Four back surgeries, diminishing fitness, psychological scars and a catalogue of personal demons seemed destined to curtail the incredible career of the greatest golfer of the modern era, but Woods stepped back into the spotlight in 2018 with a renewed sense of purpose. No more were we looking at the ageing superhero of the past five years but a humble man finally at peace with his limitations and thankful for the opportunity to return. A newly constructed swing, placing an emphasis on tempo and control, showed flashes of sizzling brilliance in the early part of the season – his irons, wand like, conjuring magic from nowhere. A chance at success came and went at the Valspar Championship, but his second place finish left no doubt that Woods was back in the game. Woods Mania didn’t take long to kick into overdrive: media speculation and analysis peppered the web, spectator numbers doubled overnight, viewership spiked across all golf-broadcasting TV stations. The hype machine was up and running, but Woods stood in the last chance saloon – well aware that this was his final opportunity at a comeback – and played it cool. A few tournaments in, PGA Tour stats were now beginning to paint their own picture on the return of Woods. Yes, he was back, his scoring averages were solid, he was still in the top percentiles with an iron and wedge in his hand, but his putter was rusty and his lack of a fairway-finding driver (way outside the top 150 players for driving accuracy) was holding him back. For a moment, Woods led the final round of The Open in July to send social media into a frenzy usually reserved exclusively for celebrity breakups and, er, Love Island, but one inopportune mistake left him in a tie for sixth come the trophy ceremony. A month later, Woods was again fighting tooth and nail for victory at the PGA Championship, clawing away at Bellerive Country Club on route to his lowest final round ever in a major, only to finish in second place, two shots shy of eventual winner and stand-out player of the year Brooks Koepka. But Woods would save his best for the last event of the season, the Tour Championship. In his greatest performance in a decade Tiger willed the opposition into submission with a display of calm and collected golf that was simply breathtaking for fans – and suffocating for his fellow competitors. Woods accomplished something his game had been threatening to do for most of the season – and, when it clicked into place, all of a sudden he was standing on top of the 30-man leaderboard. There will always be healthy debate over whose is the greatest sporting comeback, but there are very few that can rival the sight of Woods in his customary ‘Sunday Red’ striding towards his ball on the 72nd hole of the Tour Championship with a mind-boggling legion of fans chasing down the fairway after him. “He’s the Pied f***ing Piper,” Tiger Tracker – a Twitter profile dedicated to documenting every swing and stroke of this incredible athlete – wrote to his followers. And, truthfully, there is no better way to describe it. No golfer, or perhaps any sportsman ever, has had the ability to move the needle quite like Tiger Woods. He is golf – and, without him, we didn’t know what we had until it looked like he was gone for good. 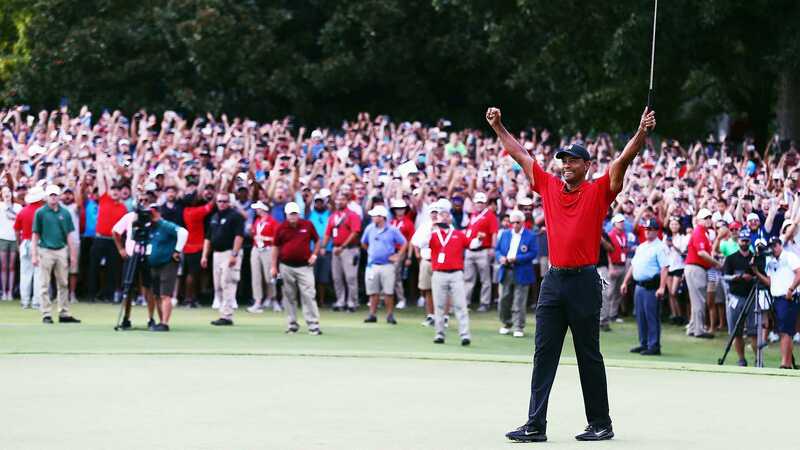 There was once a time when Tiger appeared so unbeatable he was barely considered mortal, but it’s the sheer fact of this man’s human frailties that his success now means so much. The ascent, decline and return of Tiger Woods has captivated the public more than any other athlete since OJ Simpson, but thankfully this time there’s a happy ending to the tale. One flip out of a bunker and two putts later, and an emotional Tiger had his arms aloft in celebration. There were 1,876 days between Woods’ last victories, but the Tiger roars once more.